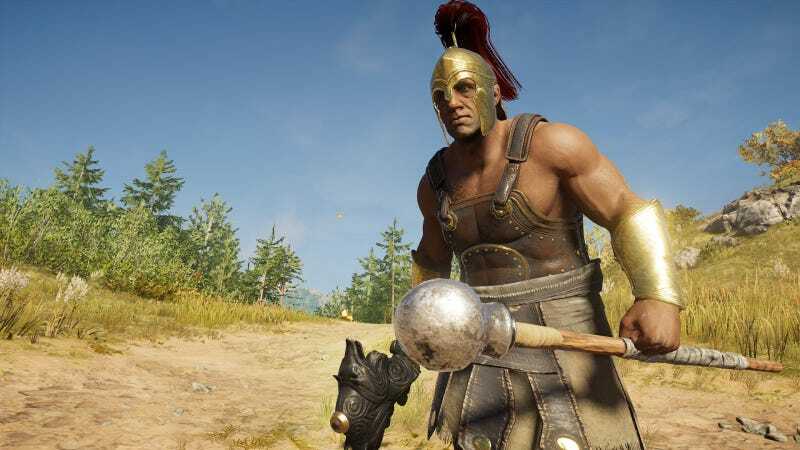 It’s been over a month since epic mercenaries were originally planned to arrive in Assassin’s Creed Odyssey, and the game has finally received its first one. These unique battles, which grant special rewards and in-game currency, could be a chance to highlight Odyssey’s combat system and challenge players to adopt new tactics. Unfortunately, the first mercenary fails to live up to their epic pedigree. Legendary mercenaries were meant to arrive in game over a month ago but were pulled after several delays. Instead, we’ve received epic ship battles and a new cyclops boss fight. Ubisoft’s pointed fun at the situation, calling the first mercenary “Damais the Indifferent” before giving him the moniker “Not So Indifferent” now that he’s in the game. But now that the first mercenary event is live, the results are disappointing. Damais is a pushover, and I found him barely worth my time. The freshly added cyclops fight wasn’t necessarily epic, but players walked away from it with something valuable in the form of of a legendary quality bow with a solid defense-boosting modifier. By comparison, Damais rewards players with a purple-tier chest piece and some extra orichalcum. It’s not a reward that feels very epic compared to what the fights are supposed to be. The fight itself felt just like any other mercenary encounter. After tracking Damais to a remote region, I opened up with a stealth attack that bit off a chunk of his health bar. But whereas some mercenaries have special tricks up their sleeves—animal companions, poison bombs, or special attacks—Damais was slow to bust out anything too difficult. He hit hard, but his heavy attacks were also easy to dodge. As a result, our long-delayed showdown didn’t offer much excitement. Odyssey’s post-launch content has varied in quality. The extra “Lost Tales of Greece” provide side quests that are humorous and mysterious. Legendary ship battles breathed life into the game’s inconsistent (and sometimes superfluous feeling) naval combat. But if mercenary battles are to stand out (as I’d expect given how long they took to implement), I’d like to see them have the same sense of grittiness found during early encounters with mercenaries in the main game. For now, fighting Damais doesn’t feel very epic at all.